Masters, J., Magidin de Kramer, R., O’Dwyer, L., Dash, S. & Russell, M. (2012). The Effects of Online Teacher Professional Development on Fourth Grade Students’ Knowledge and Practices in English Language Arts. 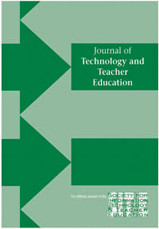 Journal of Technology and Teacher Education, 20 (1), 21-46. Waynesville, NC USA: Society for Information Technology & Teacher Education. Retrieved April 23, 2019 from https://www.learntechlib.org/primary/p/35346/.